Whether you’re an established fast-casual restaurant looking to expand, or an entrepreneur hoping to bring your unique cuisine to the masses, rolling out a food truck operation can be a smart play. In 2017, revenue for the food truck industry reached $960 million, which reflects 7.3 percent growth over the previous five years. Not too shabby for a simple kitchen on wheels. While customers love the affordable choices and different fare that food trucks offer, they also demand quick service. Many of them won’t tolerate waiting in a long line while you contend with an outdated order process and an old cash register. If there’s one similarity between traditional restaurants and food trucks, it’s that both need a POS system to achieve maximum operating efficiency. So, as you evaluate food truck POS systems and solutions, look for these eight must-have features. You’ve invested a great deal of time and creativity into your food truck concept. Please don’t blow it with a bulky POS system that takes up valuable space and gets in the way. Make sure it’s compact enough to conserve as much counter space as possible. A food truck POS should also be easy to use so that even your newest employees can use it like a pro. Before you invest in POS software, ask the solution provider for a demo of the system. You’ll want to see how many clicks it takes to enter a typical order, add modifiers, and complete an entire transaction from start to finish. Sales reports that provide a summary for a given period, but also details such as sales by hour, shift reports, and sales by location. Inventory reports to provide you with inventory valuation and also let you know when you’re running low on products. Labor reports to let you know how much you’re spending on additional employees. Customer reports that let you know who your best customers and their favorite fare. Product reports so you know what your best and worst selling menu items. Payment reports that tell you how much dough you can expect in your cash drawer at the end of the day. Also, money from credit card transactions that you can expect your payment provider to deposit in your bank account. Data from reports like these will empower you to make smart data-driven decisions such as how to maximize the profitability of menus items, optimize orders to avoid food waste, and employee scheduling to control labor costs. Many food trucks develop a raving fanbase who love sharing their discoveries on social media. 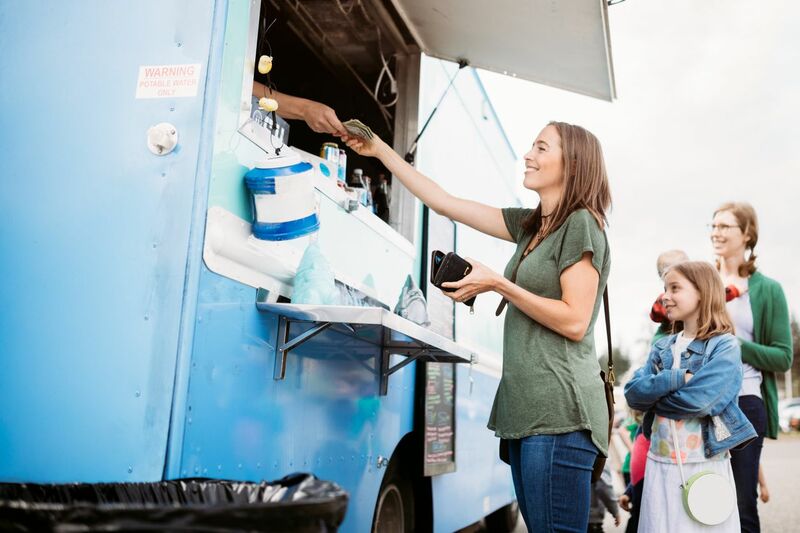 A food truck POS with a customer loyalty program can enable you to recognize these faithful customers, engage with them, and reward them for their loyalty. Like most businesses, the Pareto Principle probably applies — 80 percent of your revenue comes from 20 percent of your customers. Treat that 20 percent like VIPs whether they engage with you on social media or at the walk-up window. Additionally, if your POS system integrates with a CRM (customer relationship management) system, you can segment your marketing list and give loyal customers insider information about your next location, new menu choices, and more. When you’re serving customers at a remote location, the wrong food truck POS system can put you at the mercy of (the sometimes uncertain) internet connectivity. This unpredictability makes it vital that your food truck POS and payment processing have offline modes. Ask about this functionality and investigate what connectivity redundancies you might have, such as using cellular service when the internet isn’t available. Also, ensure that all communication methods are secure and protect payment data and your business from data breaches. Food trucks have unique workflows, so it’s essential that your POS software lets you make menu adjustments on-the-fly to keep your operation running smoothly. You won’t always have the luxury of making menu changes before the day starts or you may need to make changes as the day goes on and inventory depletes. Another critical factor to keep in mind about your mobile business is sales tax. Depending on the jurisdiction where your food truck is stationed, it will most likely be your responsibility to collect sales tax at the point of purchase. Since different municipalities have different tax rates, you’re going to need to adjust the sales tax on your menu items as you travel from one location to another. Make sure your POS system supports multiple tax rates, and you can easily switch back and forth between them and add new ones as needed. Along with sales tax, your POS software should let you quickly change menu pricing on-the-go. While your specialty empanadas might be able to fetch $12 on a street corner in New York City, that price may be a little too steep for customers at a central Pennsylvania food truck festival. The fast pace inside a food truck doesn’t leave much time for confirming employees’ clock-in and clock-outs, changing schedules, and keeping an eye on overtime. A food truck POS system should include employee management features that automate the day-to-day tasks to help you maintain control of employees and labor costs. One of the reasons customers frequent your food truck is for convenience. So, what if you could make their experience even more convenient? Allowing customers to place online orders to minimize their wait at your food truck will have appeal to many of your customers — especially for those on their way to work or with limited time for lunch. Make sure the food truck POS system allows you to accept online orders efficiently, without the need for an employee to re-enter them. If you aren’t ready to accept online orders now, make sure your food truck POS system is flexible enough to give you the option to expand your business in the future. If you want to find additional ways to engage with customers and meet their expectations for speed and efficiency, explore food truck POS systems that support options like self-serve kiosks, mobile POS, and mobile payments like Apple Pay and Android Pay. By choosing a POS solution that gives you the ability to engineer the types of experiences your customers want, you’ll have a greater chance of staying competitive. With more competition, you need to find ways to offer not only the best food but also the best customer experiences. POS systems that can provide you with capabilities such as these can be smarter, more future-proof investments for a growing business. Food Truck Operator reports a food truck investment of less than $100,000 can bring in $250,000 to $500,000 per year. To maximize those profits, however, you shouldn’t cut corners on a vital part of your operation like a food truck POS system. Choosing a cheap system just to check a box on your to-do list will have a similar impact on your business as choosing cheap ingredients for your menu. Make a smart investment that gives you the food truck POS features and functionality you need to operate your business, grow your business, and provide exceptional customer experiences.